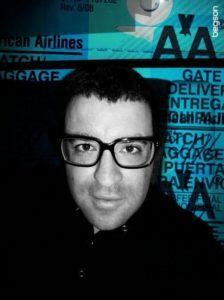 As part of our “Meet VegasTech Community Members” series, we meet Craig Holden Feinberg, the latest addition to #VegasTech’s own Walls360. The Las Vegas based team at Walls360 creates on-demand wall graphics for artists, brands, and digital content partners worldwide. They are part of the VTF Capital investment portfolio and have been a tech community pillar for years. The team was named in Entrepreneur Magazine’s 2012 list of the 100 Brilliant Companies and honored by the Technology Business Alliance of Nevada as Tech Transplant of the Year in 2011. The latest addition to the Walls360 team is Craig Holden Feinberg, who says he first started getting to know the team as a customer. Feinberg says that as a Walls360 customer, he was impressed with the company’s products and service. Since moving to Las Vegas to join Walls360, Feinberg has had the opportunity to work on design projects with amazing local clients. The Walls360 client list spans the globe, but Feinberg says many of his favorite Walls360 projects have been with Las Vegas brands and customers. He names custom wall-to-wall graphics projects with the Elvis Presley Graceland Museum at Westgate, the new Robotics Lab at UNLV, Zappos Headquarters, Life is Beautiful Festival, Downtown Project, and Best Buddies Nevada as a few of his favorite local projects. Over the past year, he has created hundreds of Walls360 designs including mandalas, animals, geometric and optical designs, inspirational quotes, and branded characters. Feinberg says he has enjoyed working on a newer offering from the company – Walls360 Coloring. 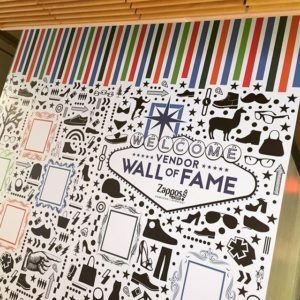 The team recently launched a new branded coloring walls graphic collection at the Las Vegas Licensing Expo, and hosted their 5th Annual Licensing Expo Open House at the Walls360 HQ to celebrate on June 22, 2016. Right now, Feinberg says he is working on a couple social issue marketing and design projects, which are keeping his plate full. Feinberg is working on a new #SolarStateNVcampaign and has also been creating products and designs for Best Buddies Nevada. Feinberg has been a frequent visitor to Las Vegas since 1998. And he says moving to Las Vegas felt like coming home. In fact, Feinberg included some of his favorite images and icons in the updated Walls360 #YesVegas infographic! Get to know others in the #VegasTech community who are up to great things in Las Vegas. Follow our “Meet #VegasTech Community Members” series here.